In most open world video games, from Grand Theft Auto to Skyrim, we tend to spend our time racing from point to point, rarely slowing down to appreciate the finer details in everything around us. A big part of that is down to game design, because open world games are built upon the idea of constantly giving you somewhere else you need to be, which transforms the world from something you’re living inside to something that has to be traversed. It’s also because many open worlds tend to rely on vast, repeated surfaces, with little distinguishing one step from the next, so you rarely feel compelled to stop and smell (or at least glance at) the roses. The Yakuza series is a little different. 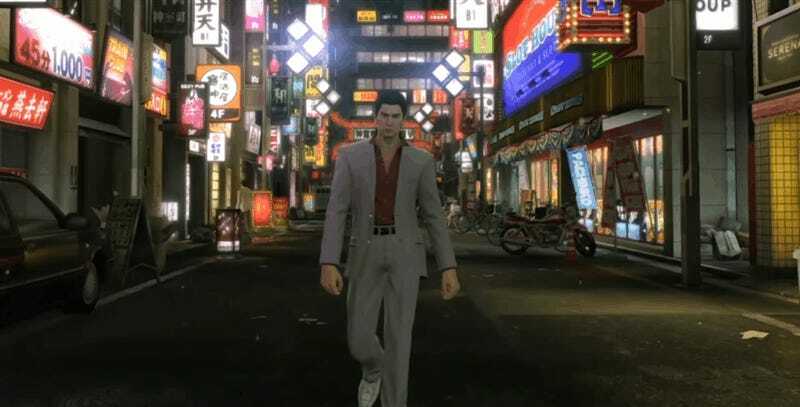 Whenever I play a Yakuza game now, and I’m not being jumped in the street by some random thugs (and then smashing a bike over their faces), I like to take a page out of the Kirk Hamilton playbook, turn off the game’s map and just...walk around. It’s an understated experience, which I think the Yakuza series is uniquely placed to take advantage of. Every Yakuza game is focused on Kamurocho, a caricature of Tokyo’s Kabukicho district, a haven for nightlife and the seedier sides of city living. It’s just the right size: big enough that there’s a sense of place, that this is somewhere people actually live and work, but small enough that you can quickly get to know your way around its streets and alleys. Not only are its urban maps much smaller than, say, Los Santos, but they’re intricately handcrafted. Almost every building, store and sign in the game is unique, giving each street and alley its own character. What’s more, as the series has moved through the ages, from Yakuza 0 (set in the 1980s) to Yakuza 6 (set in the present day), the district has retained the same map. Sure, changes have come, but only so much as they do in the real world: businesses come and go, fashions evolve. The streets of Kamurocho themselves are little changed from the series’ 2005 debut, which means anyone who has spent time on Yakuza’s pavement will know their way around. Few games can match the familiarity this repetition has bred, an ability to turn the map off and at a glance still know exactly where you are at any given moment. And more importantly, even fewer can match the intimacy. Here you can jump into a video game city, ignore all your objectives and just walk around taking in the sights, feeling like both a local and a tourist at the same time. For a game that’s so often about insane human drama and bone-cracking violence, it’s a nice change of pace, especially when you turn the sound up and start appreciating the amount of background chatter that’s going on as NPCs go about their daily lives. Below is a short example of what I’m talking about. If you’ve got a Yakuza game (and really, you should have at least one by now), and have never given this a shot, you should definitely try it out.